The International Atomic Energy Agency (IAEA) released its report on Iran, November 8, 2011. Diplomatic sources have described it as "the most damning report ever published by the IAEA and the conclusion arising from it is one: Iran is working to acquire a nuclear weapon." It expressed particular concern that Iran had carried out computer modeling studies linked to nuclear weapons. "The application of such studies to anything other than a nuclear explosive is unclear to the agency," the IAEA said. The information also indicated that Iran had built a large explosives vessel in which to conduct hydrodynamic experiments, which are "strong indicators of possible weapon development." The report undermines those previously produced under the agency's past Director General, Dr. Mohamed El Baradei. In the past, under the leadership of Mohamed ElBaradei, the IAEA reports created the false impression that the Iranian regime did not develop nuclear weapons. The night between November 9 and 10, the Night of Shattered Glass, is often viewed as the beginning of the Final Solution. 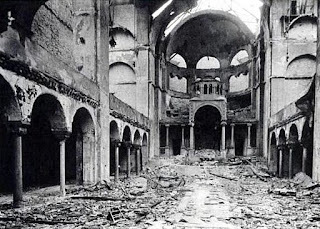 When the SA, SS and Party members arrived to set the synagogue on fire, he stood in front of the synagogue, loaded his revolver in front of the group, showing them that they could only get into the building over the dead body of the Landrat. The synagogue in Shirwindt was the only one in the district not destroyed. 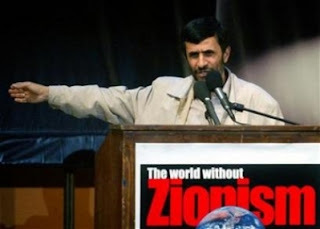 "The illegitimate Zionist regime is an outcome of the Holocaust... a political and power-seeking network … Today the Zionists dominate many of the world's centers of power, wealth, and media. Unfortunately, they have ensnared many politicians and parties, and they are plundering the wealth and assets of nations in this way, depriving peoples of their freedoms and destroying their cultures and human values by spreading their nexus of corruption." "... Like a cancer cell that spreads through the body, this regime infects any region. It must be removed from the body." It seemed Ahmadinejad was biding his time. Intelligence confirmed that Iran had the bomb, or at least was very close. Having learned from the Israelis, the Iranians enforced a policy of deliberate ambiguity as regards their weapons capacity, maintaining they had already reached nuclear capability for peaceful means. Both Iran and Syria had greatly expanded their stocks of chemical missile warheads. Russia and China warned Israel of severe sanctions if it would attack, and the government had realized that an attack most likely would miss the target(s), and serve as pretext for counter-attacks on all fronts. There was a widespread feeling that the day of the bomb was coming closer. This slim but incisive novella is a philosophical but completely comprehensible take on contemporary Israel. From a "litany of lamentations" …, the thoughtful narrator Eli Shimeoni recounts his overriding despair - but eventually concludes with hope.